We weren’t made to starve in fig trees. Remember how I’m a commitaphobe? Well this semester has been especially painful for my indecisive self because this is the last semester of my MA which means… picking a thesis topic. Even though I selected the extra class/ shorter thesis option, it still means picking a topic to invest in all semester. Finding topics is not my problem. I have in fact found at least four that intrigue me. But picking just one… I can’t do it. I love them all. How can I say goodbye to Proust? Or give up the chance to spend all semester with Camus? Or relinquish the work I have already put into animals in Colette? These are the anguishing everyday decisions of academia. (FIRST WORLD PROBLEM.) I am fully aware that they are not decisions that actually affect anything beyond my desk, but they are still ones I have to make. Last week I went to talk with my committee members, hoping they could help me muddle through my decision. Of course, they too are academics because they couldn’t handle the thought of ceasing to learn, so it didn’t really provide a clear answer. This whole process ended with me in one of their offices babbling about Sylvia Plath’s fig tree. Dramatic, I know, but doesn’t it sometimes feel like that? Wouldn’t we sometimes rather starve to death in the fig tree than choose something and be happy with it? Yes, Sylvia is writing about a feminine reality that isn’t totally true anymore. We can have a career and a family, we can choose two figs. But two still isn’t all of them. There are figs that will fall around us as we choose starvation. The professor who had to listen to my fig frustration advised me to just go home and start writing a description of each potential thesis, claiming that the one I wanted most would just reveal itself. She was right. I now have a topic, one that I am choosing to stick with, despite how temptingly figgy some of those other topics still look. Pick a fig. Be happy with it. 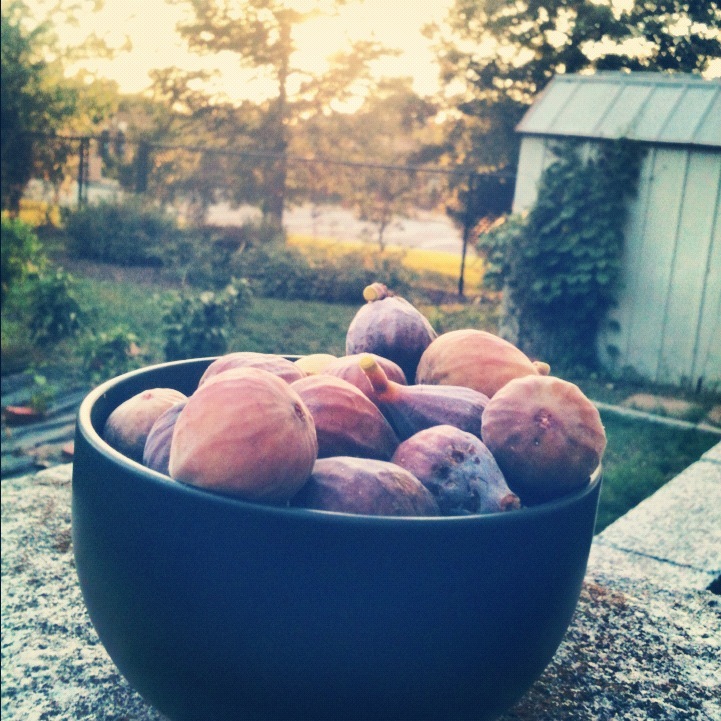 We were made for eating figs, not starving in fig trees. This entry was posted in Uncategorized and tagged books, confessions, God, literature, quotations, school, words. Bookmark the permalink. 11 Responses to We weren’t made to starve in fig trees. I love it. What a great piece. When I was taking Philosophy of the Human Person in college, one of the things that struck me was the different types of insanity. The weirdest type was the insanity that results from a multitude of options…and choosing none. It is pretty much the insanity that we are living in these days, especially as women. Don’t get me wrong, I love that I’m allowed to work and wear pants and stuff… but sometimes the options of life are overwhelming! Again, exactly what I have been mulling over all morning. Thanks. SYLVIA. She always gets it right. We’ve had this conversation a thousand times with appropriate amounts of hair pulling. And that article is a perfect response. I think it’s also important to realize that choosing from the figs is a habit you have to practice. Even after choosing the husband, the career, the baby, there are still innumerable little ways to get overwhelmed and uncommitted. Right now, I have a huge list of things I need to do TODAY. And I am liable to become so enamored with each of them that I end up doing something totally unproductive, like paint the baby’s toenails or something. (Ok, so that wouldn’t be a total loss.) Point being, choosing from the figs is never over. It’s an important habit to cultivate. Also, I miss the walking. She dies get it right, every time. Even if she decided to just throw clothes off the root instead of eating a fig. You are so right- its a daily discipline. I love how the article put it in perspective… This us a spiritual thing as much as anything else. Let us live a life of fig eating. And let us live a life of long walks too. I proud to have a daughter who can reach thru the figs, grasp the one she wants and then continue chewing on it even when there are some sour spots. That’s decision making. That’s contentment by an act of the will. Hannah, I think that Barry Cooper is the same guy who gave the sermon at CHBC that I told you about that one time! It sounds like the same sermon, in print. Really???? I was wondering about that as I read it — it’s sooooo good!! !